At the start of the 2015/16 Barclay’s Premier League season, Leicester City were a 5000/1 shot to win the league. That represents a 0.02% chance, no hopers, as close to impossibility as it gets in sporting terms. Fast forward six months to today and last season’s relegation escape artists sit proudly atop the league, five points clear of north London rivals Arsenal and Tottenham, and a further point ahead of financial powerhouse Manchester City. What is their probability of winning the league today you ask? 2/1 co favourites, (33.33% likely) a staggering 1,666 times more likely than they were before the first ball was kicked in August. The Champions League beckons and with it financial rewards surely even beyond Claudio Ranieri’s wildest dreams. The Leicester City players’ bonus pot must be spilling over however and this will represent significant outgoings for the club. Mitigating the financial risk associated with the trappings of success makes sense – but why hedge something that has "no chance" of happening? Let’s say for arguments sake that Leicester had bonuses of £10,000,000 for winning the Premier League and we use their pre-season probability as a cost for the hedge (0.02%) - the cost to cover the bonus payout would have been a meagre £2,000. Now however, taking the potential payout of £10,000,000 off the table would cost the club a whopping £3.3million (!). I'm not usually a fan of the expression "closing the stable door after the horse has bolted" but in this instance the horse is miles away. When Portsmouth won the FA Cup in 2008, the success triggered a sequence of bonus payments that would be the catalyst for the club’s financial demise. On the 2008 win David James spoke to the BBC and said “To offer people the opportunity of big bonuses to qualify for Europe seems like a pretty safe bet, simply because you do not anticipate a club like Portsmouth winning the Cup. Having won the cup, the financial impact was crippling and then as a squad we just were not kitted out to be able to sustain the European, as well as league and cup campaigns which followed. We ended up suffering on both fronts”. Regardless of who wins the title this season it will be fascinating to see how Leicester’s squad copes with the rigours of both European and domestic football next season. The great thing about sport, the thing that we as fans love most is that miracles can happen. The underdog can rise from adversity to claim famous and unlikely victories. 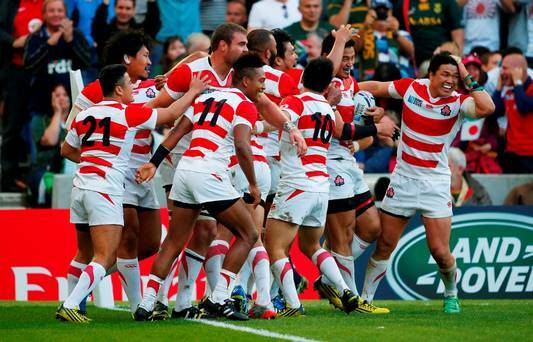 Take Japan at the 2015 Rugby World Cup for example who had never even come close to beating a tier 1 nation only to topple the mighty Springboks and come within a hair's breadth of the Quarter Finals. A 66/1 miracle for the Brave Blossoms and yet not even remotely close to Leicester City's achievements thus far. A year ago to the day, Leicester City were rock bottom of the Premier League and four points from safety. They proceeded to go on a remarkable run winning seven from their last nine games. During this run of wins, Claudio Ranieri was in charge of the Greece National team who themselves enjoyed a piece of immortality when they shocked the football world to win the 2004 European Championships as a 150/1 outsider. If Leicester can hang on, as the vast majority of sports fans are willing them to do then surely it will be the greatest upset of them all. One for the little guys, the underdogs, the dreamers and the hopeless romantics. A true sporting fairy tale.